vegan | What about this? A bowl of salad should contain wholesome and healthy ingredients. Not all do. 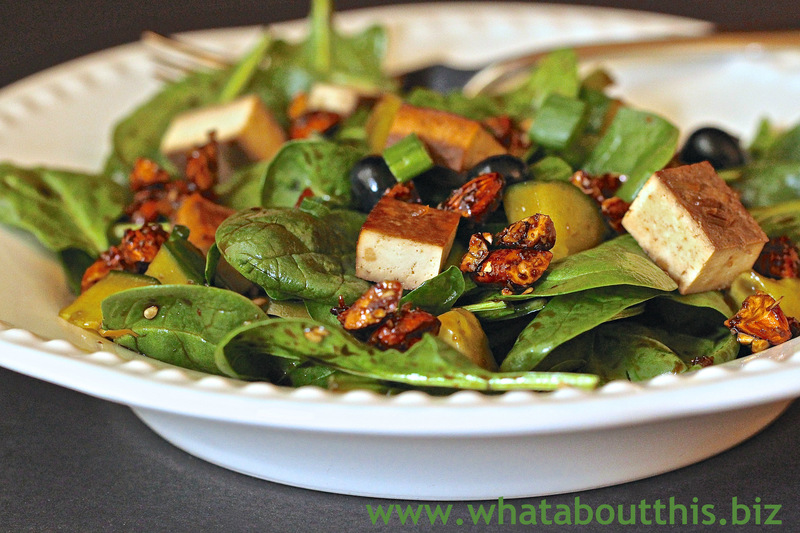 With spinach, tofu, almonds, blueberries, and cucumbers as its primary ingredients, this Asian-inspired salad is loaded with nutrients and exotic flavors. Plus, this recipe is actually three recipes in one: a salad with salad dressing, Lemongrass Tofu, and 5-Spice Tamari Almonds. 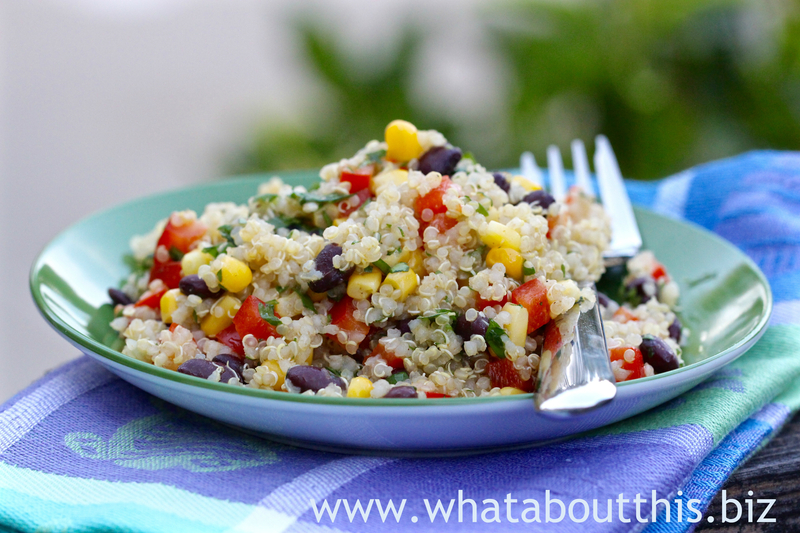 All the parts are wonderfully versatile and will enliven your ho-hum salad repertoire. 1. 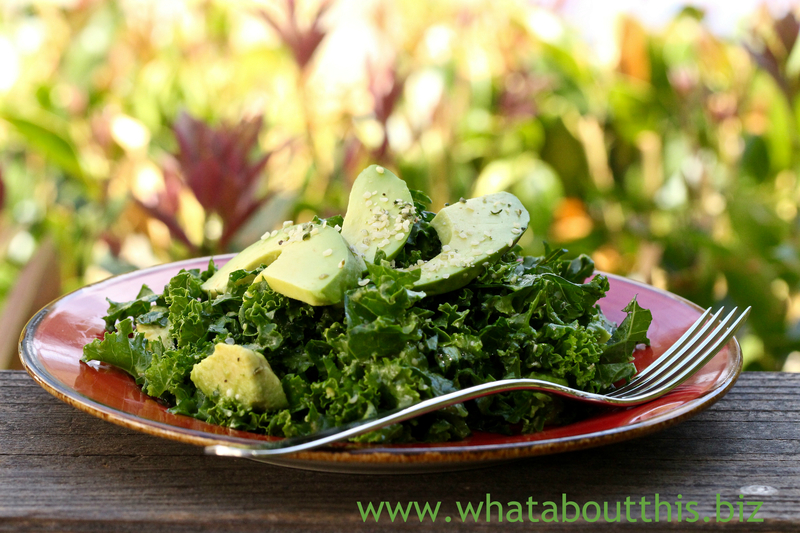 Place the blueberries, cucumbers, scallions, and greens in a large salad bowl. 2. In a glass measuring cup or bowl, whisk together the tamari, maple syrup, sesame oil, sesame seeds, ginger, and red pepper. 3. Pour the dressing over the salad, toss to coat, and divide among serving bowls. Top with almonds and tofu, if using, and serve. A. Slice 1 pound of tofu in half and slice each half again. 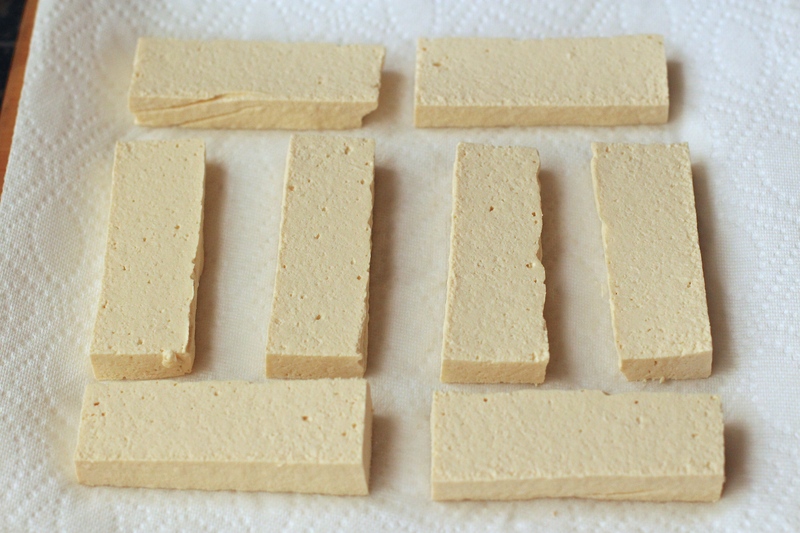 Slice each remaining piece in half for a total of 8 slabs of tofu of equal thickness. B. Layer a large cutting board with clean towels or paper towels. Arrange the tofu slices in a single layer on the towel. 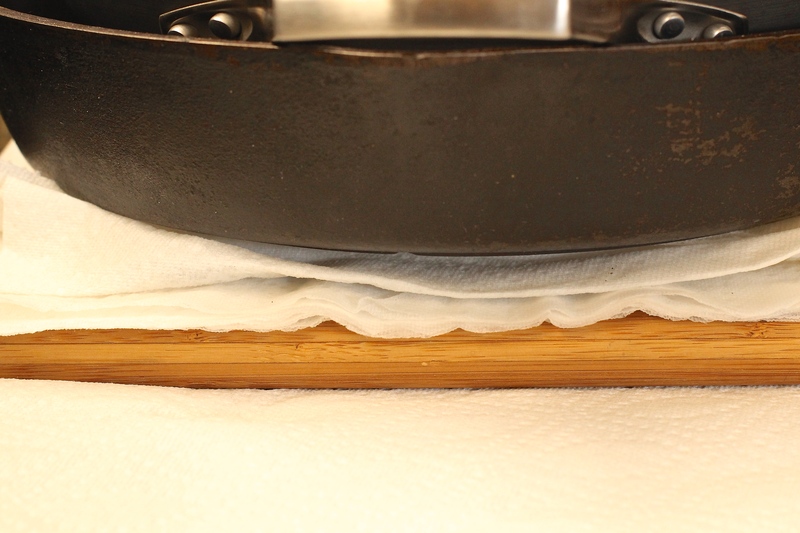 C. Spread another towel over the tofu, and then press another cutting board on top of the towel. Stack a few heavy things on the cutting board: cans, cast-iron pans, 300-page cookbooks, etc. D. Press tofu for 20 minutes, or up to an hour. Tofu will ooze water, so it’s best to arrange this near a sink, propped on a slight angle on the edge of the sink to drain. 2. 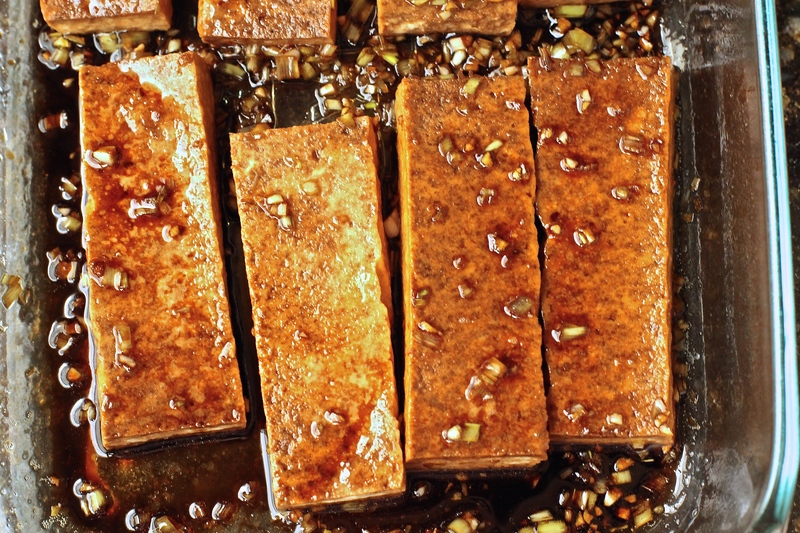 Slice the pressed tofu into thin 1/4-inch strips. 3. Preheat the oven to 400° F and coat the bottom and sides of a 13 x 9-inch ceramic or glass baking dish with cooking spray. 4. Combine the maple syrup, tamari, lemongrass, garlic, and oil in the baking dish and whisk together. Arrange the tofu slices in the marinade and set aside while the oven is preheating, about 15 minutes. Occasionally stir the tofu strips. 5. Bake the tofu for 20 minutes. Remove from the oven and flip the strips over. Bake another 15 to 20 minutes, until the strips are golden and the marinade is absorbed. 6. Serve warm or chilled. Store chilled and consume within 2 days for best flavor. 2. In a 13 x 9-inch metal or ceramic baking dish, combine the almonds, agave, tamari, and 5-spice powder. Stir until the nuts are completely coated. Sprinkle with salt. 3. Roast the nuts for 16 to 18 minutes, stirring occasionally, until a sticky glaze forms. Remove from the oven and immediately transfer the nuts to a lightly oiled sheet of parchment paper or aluminum foil, and use a fork to break apart any clumps of nuts. 4. Once completely cool, store the nuts in a tightly covered container. Use within 2 weeks. 1. Chinese 5-spice powder is a blend of star anise, cinnamon, fennel, cloves, and Sichuan pepper. Jars of it can be found in the spice aisle of Asian markets. 2. Tamari is a Japanese soy sauce. If you follow a gluten-free diet, look for bottles of tamari that are wheat-free/gluten-free. 3. Save yourself a step and purchase pre-toasted sesame seeds at your Asian market. 4. I made the 5-Spice Tamari Almonds, the salad dressing, and the Lemongrass Tofu the day before serving. 5. 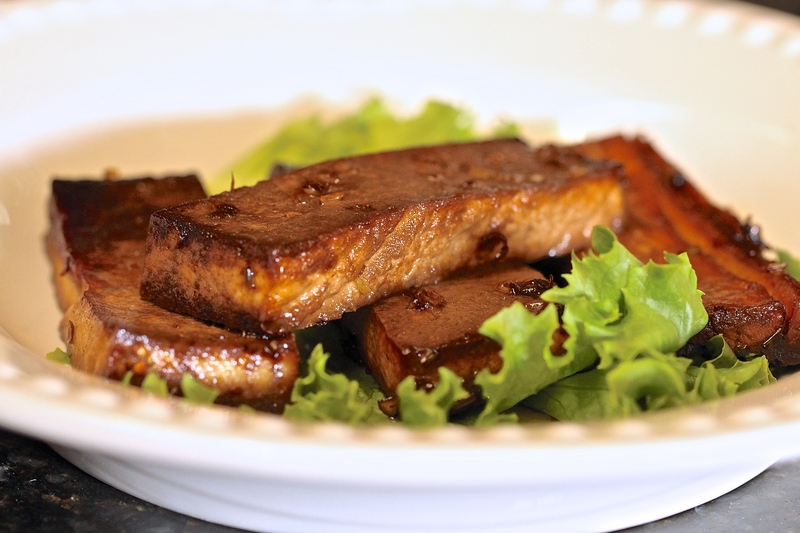 My Lemongrass Tofu had absorbed the marinade and was golden-dark brown by the end of the first 20 minute cook time. 6. I felt that making the nuts not only added work, but also an added another tamari-flavored ingredient. The next time I make this salad, I will add freshly toasted plain almond pieces to the salad. 7. I added a splash of rice vinegar to the salad dressing, because I felt like it needed it. 8. Do not toss the salad with all of dressing. 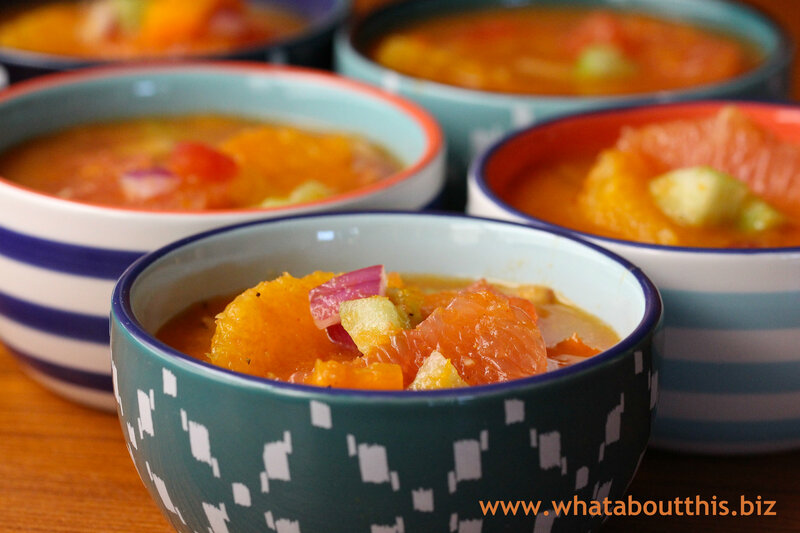 You will only need a fraction of the dressing or it will overwhelm the other ingredients. Keep in mind, also, that all the ingredients will take on the color of the dressing. Want to serve your sweetheart a killer dessert for Valentine’s Day that won’t kill him? Instead, present him with this cool and creamy mousse that’s rich in flavor, but not heavy in saturated fats, cholesterol, and calories. Don’t mention to him that the base of this luscious chocolate-orange treat is silken tofu—he’ll never guess. Before some of you utter, “Eww . . . tofu,” make this dessert for yourself and then recognize that silken tofu, with its smooth texture and neutral taste, makes the perfect base for a healthy mousse. Plus, after you check the nutritional data below and see that this dessert has no cholesterol, only 40 calories from fat, and a mere 1.5 G of saturated fat, it might just become your favorite dessert. 1. Process the tofu, cocoa powder, maple syrup, orange zest, coffee granules, vanilla, salt, and optional liqueur in the bowl of a food processor or in a blender for 1½ minutes, until smooth. 2. Pour the mousse into wine or champagne glasses or dessert-type serving dishes, and chill overnight. 3. 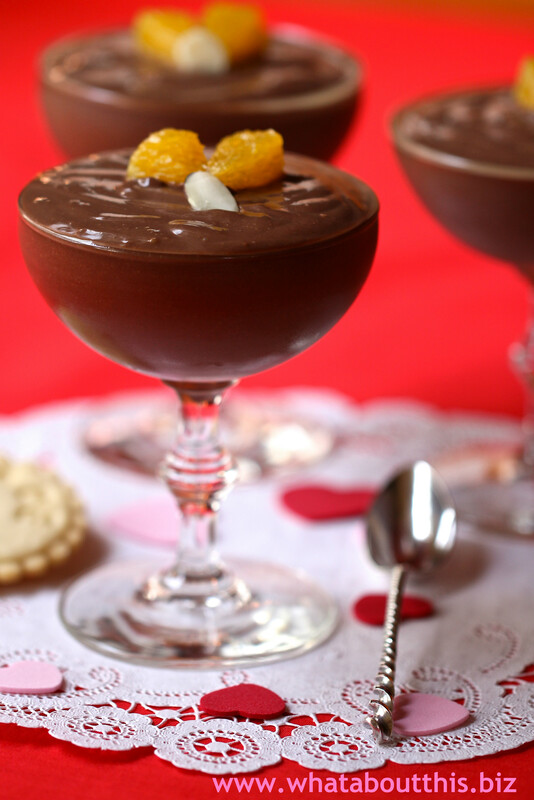 Serve the mousse with fresh orange sections, toasted almonds, or shaved chocolate garnish over the top. 1. In general, but depending on brands, tofu is a good source of calcium. 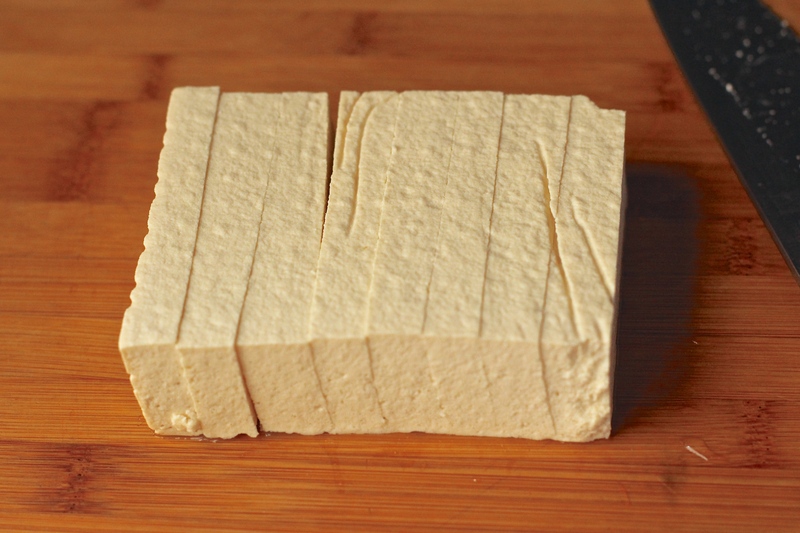 Look for brands in which the tofu has been set with calcium sulfate. 2. Because a rich chocolate flavor is critical to this dessert, use a good quality cocoa powder. I used Sharffen Berger Unsweetened Natural Cocoa Powder. 3. Amaretto is the almond liqueur I used. Rather than add the full amount of liqueur at first, I would add it to taste. 4. Adapt this recipe using other flavors. Raspberry, mint, or coffee liqueur would be interesting variations to the recipe. 5. I filled 3 champagne glasses to the brim with one recipe’s worth of mousse. If I had not filled them to the top, I probably could have gotten 4 servings out of the recipe.